Ohhh, yeahhh...pulled pork, baby. If you ever spent time eating CUE this may be a favorite indulgence of yours. The city with the best pulled pork is a discussion between Raleigh, Memphis, Atlanta, and Houston. Personally, I am a North Carolina BBQ gal. Since I live in Massachusetts, it is a wee bit difficult to get my hands on any. Hungry Girl, AKA Lisa Lillen, has put out a new book “Hungry Girl to The Max: The Ultimate Guilt-Free Cookbook” and she came up with a brilliant idea for pulled pork. Instead of using all of the fattiest cuts (like pork shoulder), she used ½ pork tenderloin (a very lean cut) in combination with a fattier cut. This is such a great idea because you are able to cut the fat, but not ALL of the fat. I was really excited to see this because I have been dreaming of a way to make a healthier version of pulled pork. Hurray! There are 650 recipes in Hungry Girl's new book and many of them aim to help you make over many of your favorite comfort foods. She includes “Not-Your-Mom’s Tater Tot Casserole” where she uses spinach and mushrooms and there are all sorts of makeovers for egg nog. If you are into fries, she has 10 different recipes to make them over (Grin ‘n Carrot Fries, anyone?). All the nutritional facts for the recipes are included so you can see how many calories you are saving by using her makeovers. Check out this pulled pork recipe and let me know if it hits that BBQ spot in your heart. Have you checked out the new HG book? What do you think? In a crock pot, mix tomato sauce, ketchup, vinegar, sugar, and garlic powder. Season both types of pork with salt and pepper and add to the pot. Top with onion and lightly stir. Cover and cook on high for 3 to 4 hours or on low for 7 to 8 hours, until pork is cooked through. Transfer pork to a large bowl. Shred with two forks -one to hold the meat in place and one to scrape across and shred it. 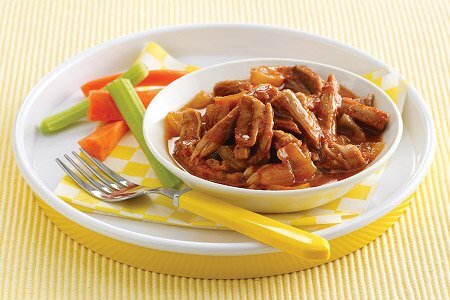 Return shredded pork to the crock pot and mix well. I think my husband would like this. I've been eating very little meat. I like some of Hungry Girl recipes, but you have to watch she uses process foods w/HFCS. Happy Halloween!!! I think I will make this Sunday. Perfect football watching food. And I just might have to run down to the bookstore & check out Hungry Girl's cookbook. I love the recipe! I have a pork tenderloin in the freezer that I want to use! I have made a new folder on my computer just to store all these fabulous ideas in! Thank you Snack Girl!! I live in Raleigh and although I'm not the biggest barbecue fan, I do love pulled pork here in NC! Thanks for this yummy recipe! Wow. This is one of the few Hungry Girl recipes that I've seen that doesn't have any sugar-free or fat-free items in it! I do have a pulled pork recipe that I already love though... It has garlic and broth and that is pretty much it! Easy and delicious. Unfortunately, Hungry Girl is a huge fan of processed ingredients and artificial sweeteners. This recipe looks okay, as long as you use a clean ketchup. This sounds fabulous. How much constitutes a serving? I have made my pulled pork from 100% pork loin for years--you simply do not need 1/2 of it to be from a "fatty" cut!! I cook my pork loin first in the crockpot and it practically falls apart. I then add the BBQ sauce to the shredded pork and let it "simmer" in the crockpot with the sauce about another hour. Lean and mean!! I don't eat meat so I didn't try this recipe. But, I have all the Hungry Girl cookbooks. I love them. She has a lot of vegetarian recipes and options, which I love. Yes she uses some processed food and fat free items, but she tells people to change the recipe to make it work for them. I use all recipes, Hungry Girl's and others, as a starting point. If I didn't, my food would be boring.